Don’t be fooled by how easy these are. (You’ll notice there’s no eggs or oil in this recipe…don’t let that scare you, the Sprite is magic, I tell you!) They are adorable to look at and even better to eat! 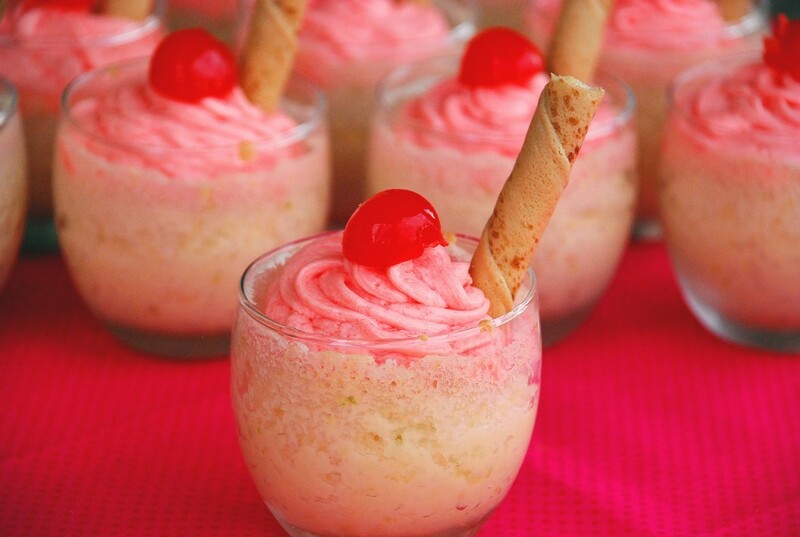 I think these are best when the limeade-drenched cupcakes are refrigerated overnight. Something about that soaking time makes the pucker factor deeee-licious. red food coloring, as desired for "pinkness"
Place shot glasses/votive holders on a baking sheet and spray with nonstick cooking spray. Fill 1/2 full with cake batter and bake at 325 degrees for 18-22 minutes until done (Centers won't be jiggly when you give the pan a shake.) Remove from oven and let cool completely. Poke each cooled cake several times with a toothpick and drizzle with limeade concentrate. Cut pirouette cookies in half. These will be your “straws”. Put frosting in ziploc bag w/ a piping tip if desired (I use Wilton 2D but if you don’t have one just snip off the end of the baggie and pipe straight from it.) 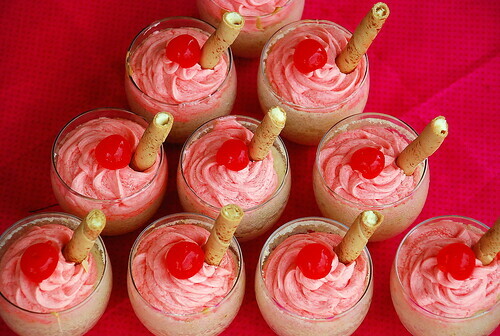 Pipe frosting onto each cupcake, top with a halved maraschino cherry and insert your straw. Serve or refrigerate until needed. Cream butter with an electric mixer. Gradually add the powdered sugar and mix until combined. Add the cherry juice and mix until combined. Add enough whipping cream until you get your desired consistency, you may not need all of it, or you might want to add more. Add food coloring if desired. Makes 20-32 depending on the size of your cups/votives/shot glasses.